Nice to know the xfrmrs are good, but I never would have plugged it in without going over it first! 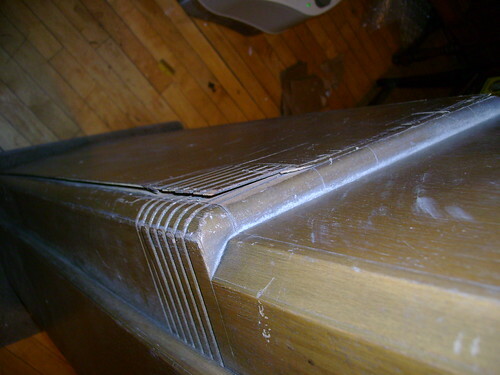 It's filthy and the veneer is in rough shape, but it appears to be all original and unmolested. I'm not sure about that finish though. It's kind of a dull brown - not very attractive. It'll stay in the garage until I can round up some help. I'm not sure if the clock is working yet or if there should be glass over it. The speak is in rough shape There are large tears in the cone and I have no idea how it should be covered. Cloth? I wonder about the acoustics. Isn't pointing a speaker straight up a bad idea ? The chassis looks to be in good condition. 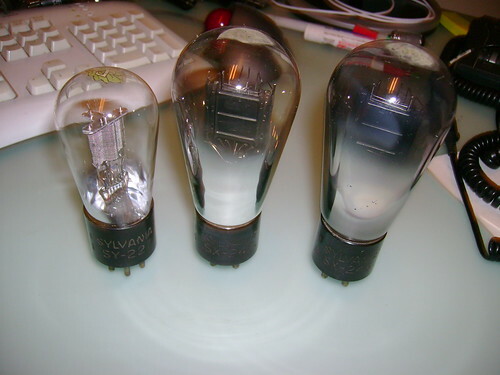 Lots of nice, old Sylvania tubes with the green leaf label including some 245s. Filthy, but they clean up real nice. I really don't know anything about this model so any info or advice is much appreciated. More pictures here if you are interested. 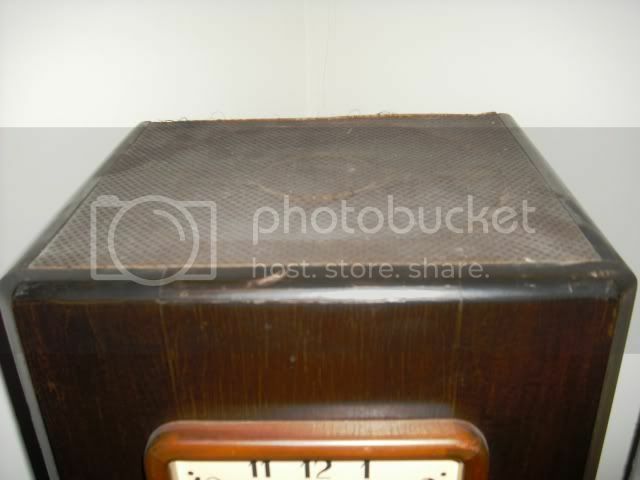 Over the speaker, on the top, it used to have a wicker screen surrounded by a wooden frame. 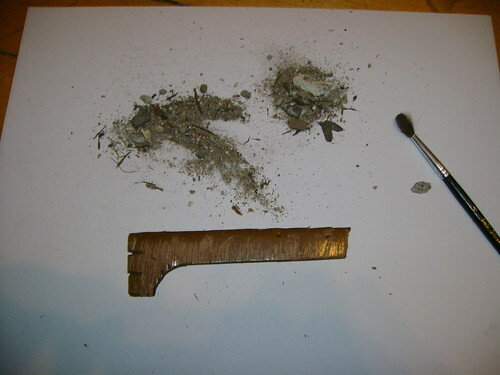 Maybe the previous owner still has that, if not you will need to find another or reproduce it in some way. It also had a clear glass over top of the clock dial. Beautiful radio! 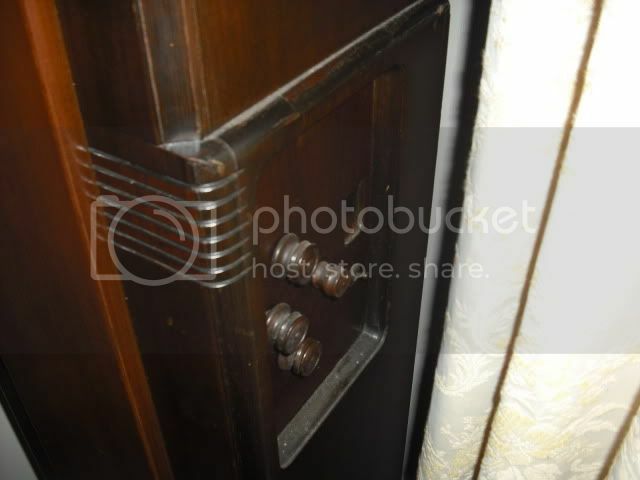 All I can tell you is that it was made in 1931. Those tubes are nice! Don't drop those 45's. Very very expensive. 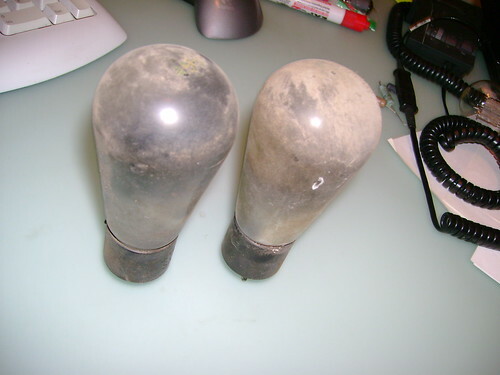 I'd take those two globe 45 tubes and wrap them in cotton, and put them someplace where they won't fall over. You wouldn't want to know what replacement 45 globes are going for. I have one of those as well. 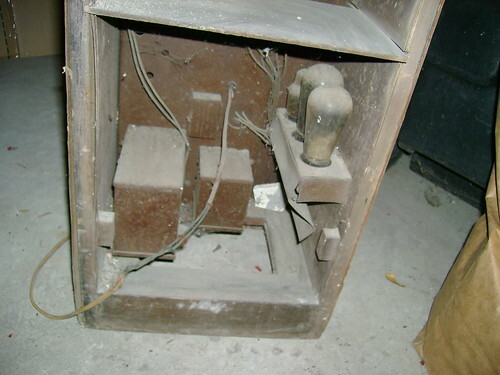 It's living in my cellar, awaiting restoration. Only thing is I have no idea where to put it when it is done! Mine didn't have a clock glass, I never knew it was supposed to. yes its an extremely heavy set. they made one model with a 'remote control'. it wasnt really remote as it had this huge thick cord attached to the control unit. kinda ahead of its time for 1931 though. 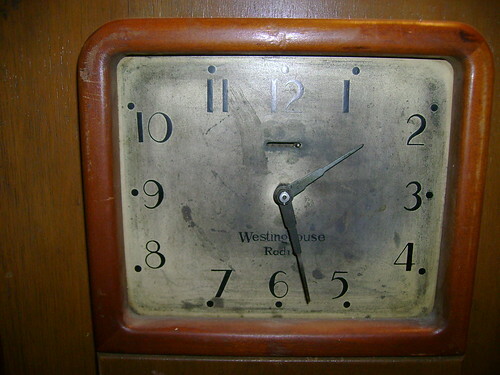 its tough to clean the clock face so you might want to consider painting it if you dont like the worn look. Since the bottom 1/3 of the cabinet appears darker the light is probably sun fade. Unless you're a purist and want the "original finish to remain" it's a good strip and refinish candidate. 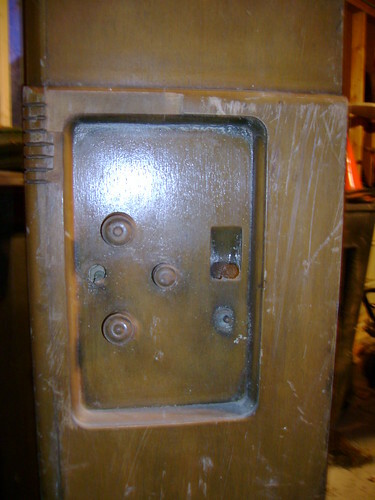 You could try Howard's Restore a Finish to see if it will improve. Nice find, those don't show up very often. That is a thing of beauty, I would love to have that. Does your's have the top "cap" ? If so, could you provide a photo? Maybe I can replicate it. Here's a threadwhere the clock glass topic is debated. Perhaps they weren't supposed to have glass after all ? 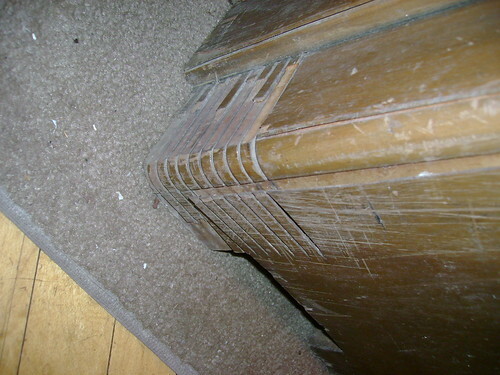 The veneer is separating in many spots and some is missing. So, I'm planning on stripping it, regluing the separations and maybe patch the missing bits. I'll need tp determine if it's walnut or mahogany. Any thoughts on what the original finish might have looked like ? Here's some photos of my WR-8. I bought it a few years ago from a forum member in the Chicago area. I don't know if the finish is original but it looks similar to others I have seen. My clock is a newer replacement. It's surprising how many of those WR-8s, or the Canadian equivalents, I have seen. 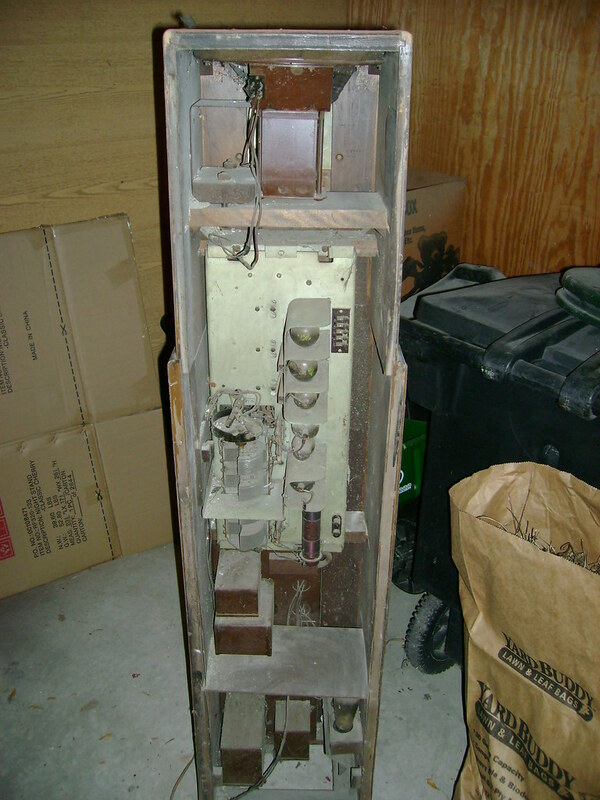 Out of the long cased radio/clock combinations the WR-8 Columnaire must have been one of the best selling in it's day, the runner up would be one of the Philco units with the model 70 chassis. 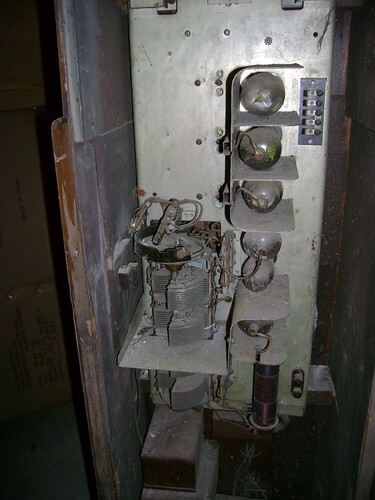 The only trouble is that half the ones I see seem to have had the radio chassis and speaker removed. Y2K Bruce, that is a beautiful radio. I like the looks of it much better than my WR-15 Columaire Jr. I like those side controls and dial, but I am glad my radio is not that heavy. Finish is definitely not original, this was originally a two tone finish so it was refinished at some point in the distant past. You're thinking of the other columnaire consoles, the WR-8 used a cloth speaker covering, not wicker as the other models did. It was pretty much just a piece of masonite board, with a pattern cut out of it for the speaker, covered with speaker cloth. The cover just sat in the top, afaik there was nothing to "fix" it to the console cabinet originally (no stables or anything like that). It was a snug of a fit that it wouldn't normally go anywhere. 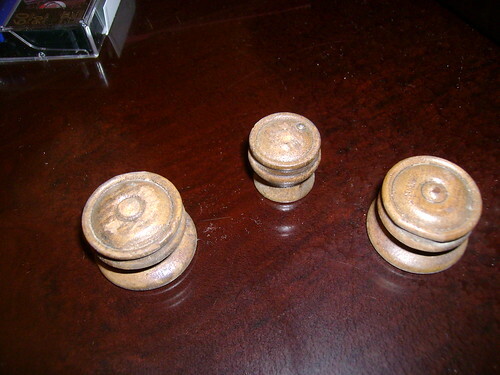 There was also a masonite back on these sets, but almost all of them are missing it. Thanks for the great photos Y2K Bruce. I like that two-tone finish a lot. Maybe dark walnut toner on the sides and light walnut in the center? I finally got it up two flights of stairs and took some more photos. I don't see any evidence of there ever being glass. Any thoughts on cleaning the clock face? I think it may be all paint. Black numerals on a white background. Probably need to have it re-painted to look good again. Here's the speaker in more detail and my little fragment of cloth. It sure needs a re-coning! Should there be horizontal bracing at these two points? Seem like somethings missing. 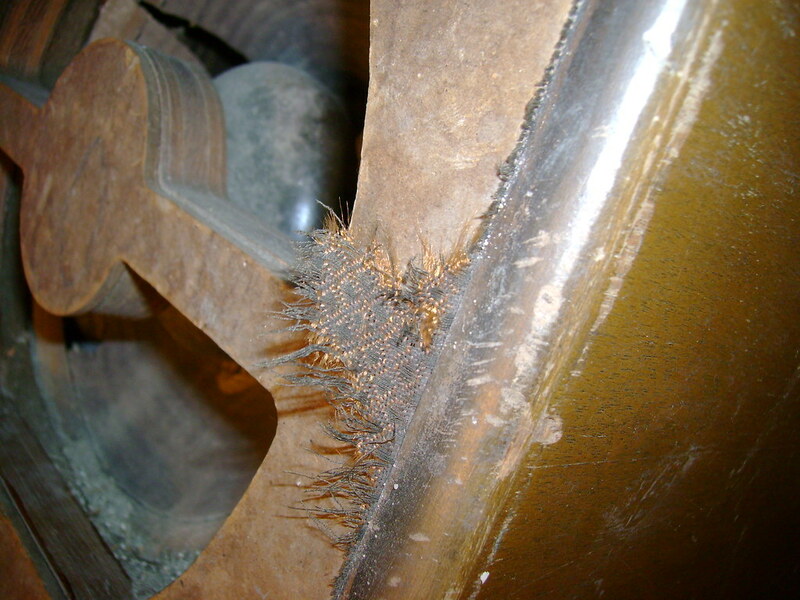 Veneer damage. The separation isn't so bad - I can glue it back down. The missing bits are another story. Any guesses on the wood? 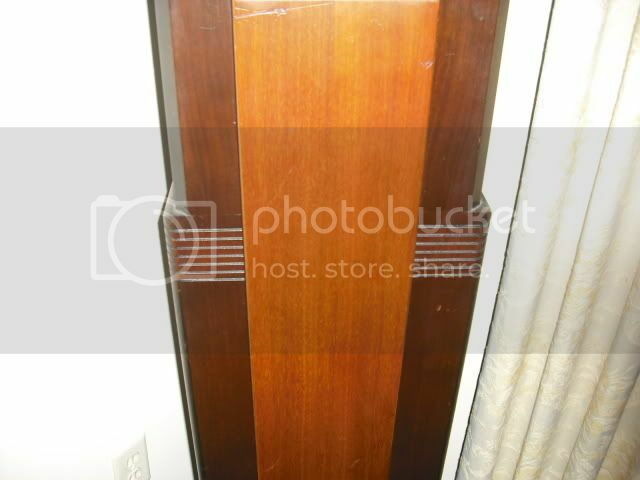 I figure it's either mahogany or walnut. Last edited by bandersen on Dec Sat 12, 2009 6:00 am, edited 2 times in total. I'm glad because that seemed like a tricky bit to replace. 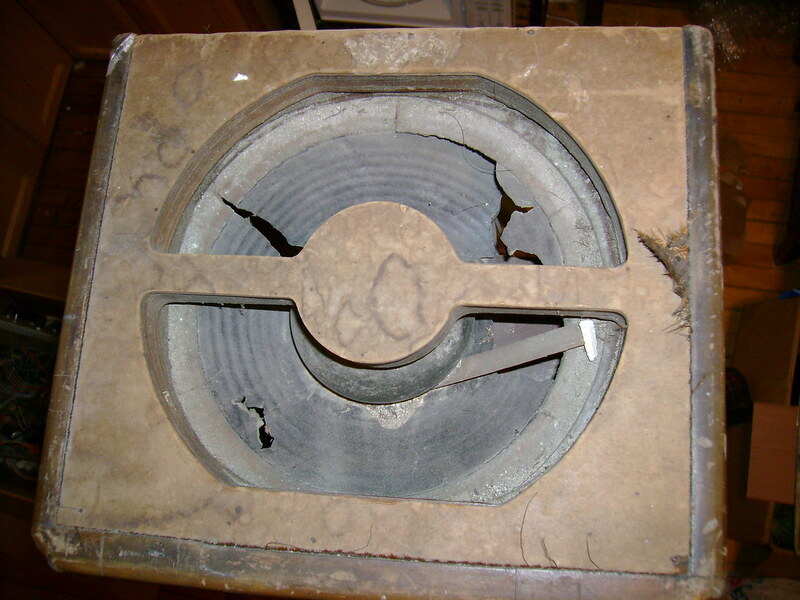 Since you're in Chicago, J&J Speaker repair on W. Diversey should be able to re-cone the speaker. The clock probably isn't "self starting". You start it by slding the lever at the top to the opposite position and then releasing it. Sometimes you can make those clocks run backward. 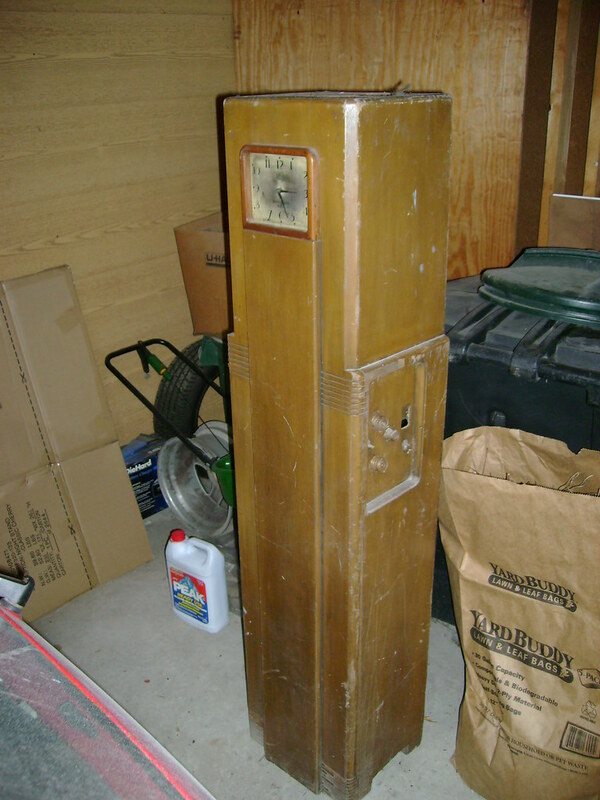 I have a different model Westinghouse Columaire and can do that with its clock. I have two of the WR-8 sets, and have had them for a few decades. One has the wired remote, and the other hasn't. 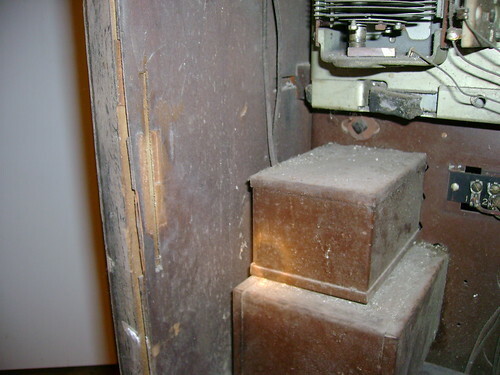 The radio chassis is the RCA Radiola 82. 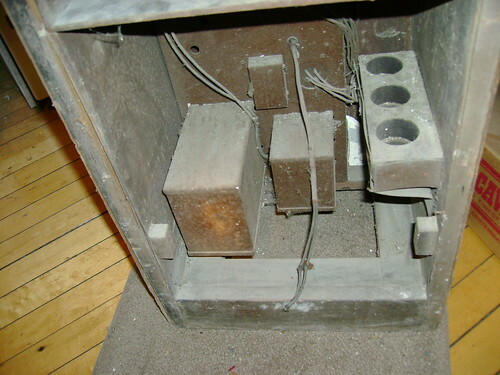 You may not need to a re-cap on the set.The filter caps are not electrolytic, and the rest of the set has only a few by-passes in it. Alignment may be off, and should be checked. 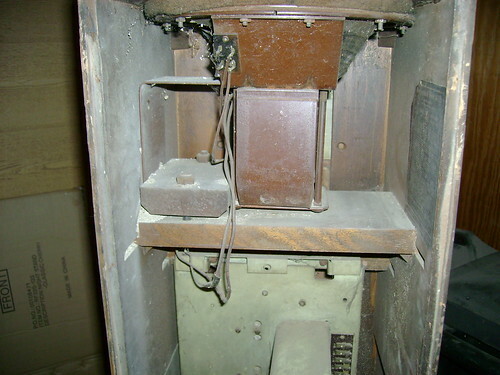 The dial screen is usually missing from the bezel. http://www.grillecloth.com. I haven't his pattern number on the tip of my tongue, but if you send me a personal message off line,I'll get it to you. The wood veneer is walnut, and the center section of the front face is another wood, which was finished lighter; almost a dark blonde. The walnut is finished in dark coloring, so if it's dark now, it's correct. The front center section is wood screwed from the back and is easily removed, making the work and the finishing of the cabinet easier. 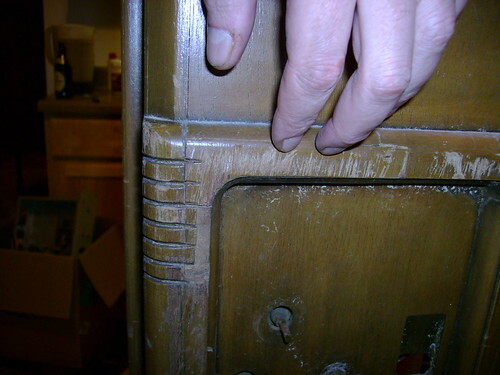 There was a masonite back cover for these sets, and is often still on the cabinet. Yep, and how, the thing is heavy! It can be moved by hugging the cabinet, and lugging it around. 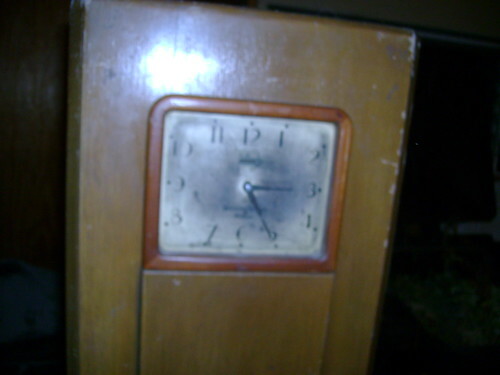 Thye clock dial appears to be a matte german silver base finish, with the numerals silk screened on it. The clock movement is a unique character, and is not a conventional self-start or spin-start type. There was once an interesting description on the internet about it. The second hand advances with an escapement of sorts. 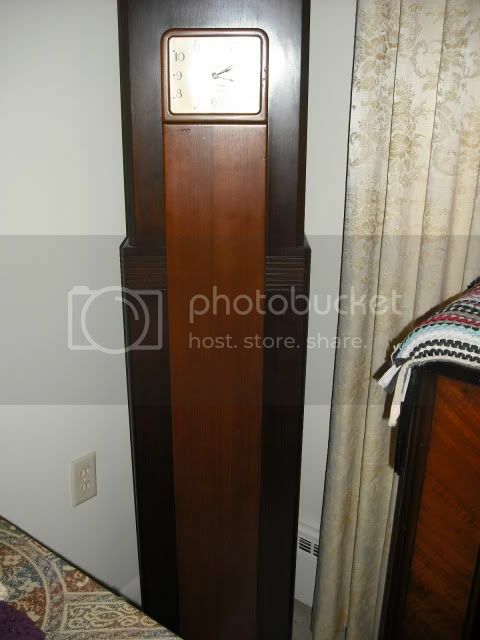 If you can preserve the original clock, by all, means do so. 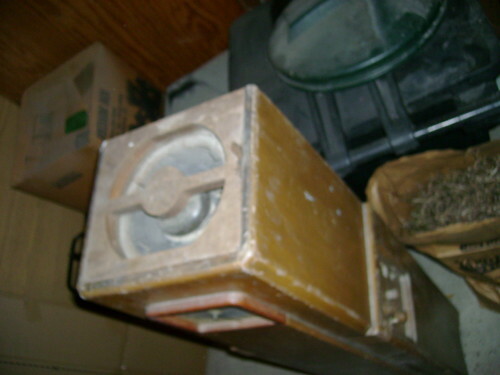 Yes, I have seen one of the WR-8 columnaires with a celluloid cover over the clock dial. I too, always wondered if there had ever been protection for it, and there was. 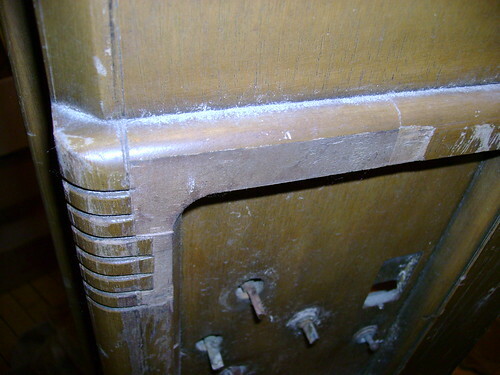 It's a sort of formed bubble, of cellouloid, that just slips into the wood surround for the clock face. It would be easy to heat form from acetate sheet, as art stores sell. I've never done it, but it's another item on my long waiting list. I don't know how hany dozens of these sets I've seen over the years, but I've seen only one with that celluloid cover! One of my WR-8's has the original finish, and I have a pix of it somewhere. I've tried to put pictures on this board, but it just doesn't work for me. At one time, a friend, who was in GM styling was admiring one of my WR-8's, and remarked about its strong art-deco design. Thanks for all the great info Doug! That explains how the radio is working without any hum even though it hasn't been recapped yet. My dial screen is missing too. Good to know that panel is removeable. That will definitely help! You're right the clock face is silver. I put a little TarnX on a Q-tip and went over a small area. It did clean it up a bit, but I think I'd really need to use some silver polish to get it bright again. All that rubbing might ruin the painted on numbers though. I've tried making a few plastic covers for another set with a wooden mold, plastic and my oven. It worked out OK, but I think the plastic I'm using is wrong because I had to really crank of the heat to get is soft. I think I can handle the chassis restoration. Looks like it mostly needs a good cleaning.